A grounding in ethics was essential to communications and writing classes—whether I was a student or a teacher. A guest presentation by a research librarian underscored vetting of sources. My social media instructors stressed online etiquette and screening of information before sharing it. In an instant world, they cautioned consideration of style, tone, and voice (plus emotional state) before posting. I’m curious. Why do courses require students to follow these practices, yet we witness the equivalent of road rage in new and traditional media? In its infancy, the internet was “the information highway.” Today, charged posts leave debris akin to a multi-car pile-up. Technology enables immediate sharing of information. But if used without restraint, it opens the door to chaos. If a person hits the “post” button or mouths off before thinking through the basics—ethics, vetting of sources, and tone—then he or she contributes to a rising tide of misinformation, anxiety, fear, and stress. Wrongly chosen, the words of the most powerful can shake a society, indeed the world, to its foundation. Who needs that wearying in environments already in 24/7 overdrive? How does the current behavior in the public square impact future generations—their expression, reasoning, and capacity for empathy? Do pundits who stir up yelling panels provide a service? Are all journalists purveyors of “fake news”? Our world is increasingly complex, yet it’s so easy to paint groups of people with broad strokes. Yes, authentic journalists do exist. They work hard every day to seek and tell the truth without editorializing. In fact, some are fine people. The recent death of beloved Alabama newsman Bill Bolen gave me pause. Birmingham journalist Bob Carlton remembered him as “the elder statesman of Birmingham anchors.” Mr. Bolen sustained a rock-solid career spanning six decades. Whether covering civil rights or space flights, he delivered the news with sincerity and ethics at the heart of every word. Generations of Birmingham citizens awoke to his mannered voice, sharp mind, and wit. Mr. Bolen did not seek accolades, yet his profession and community honored his legacy. He received the Life Inspiration Award from the American Cancer Society in 1997 and the Gold Circle Award from the National Academy of Television Arts & Sciences in 2005. The University of Alabama College of Communication and Information Sciences inducted him into its Hall of Fame in 2014. “Being half as good as Bill Bolen is greatness,” recalled Dennis Leonard, a former general manager of WBRC Fox 6 in Birmingham. Was he coming in to bludgeon his audience with a bunch of Bible verses? No. He was preparing to deliver the news with thoughtfulness and responsibility. 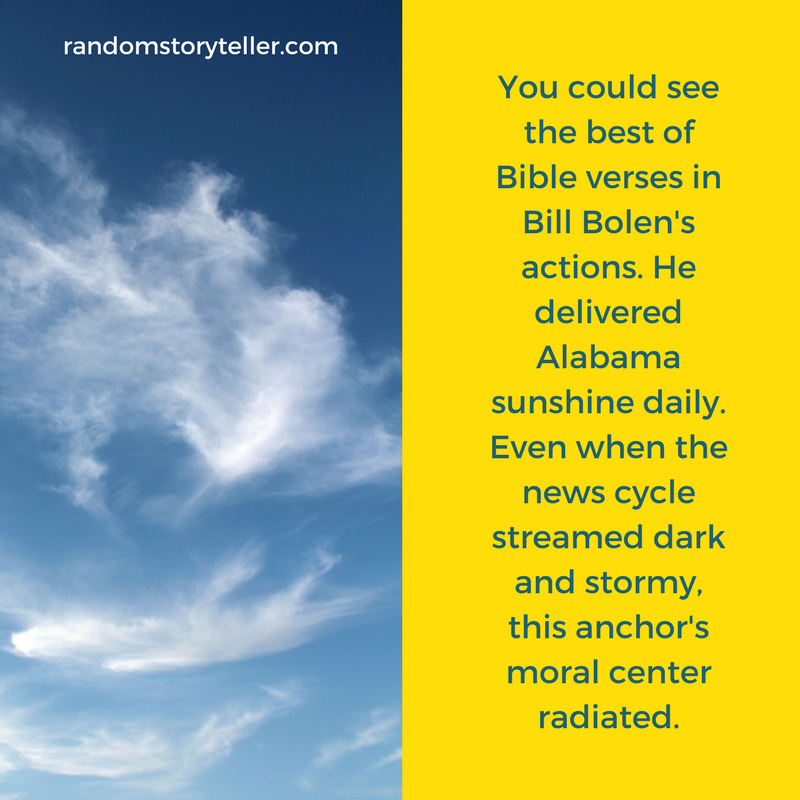 You could see the best of Bible verses in Bill Bolen’s actions. His words resonated with professionalism. He gave Alabama a daily dose of sunshine. His twinkling eyes, bright smile, and calming tone—tinged with the accent of a Southern gentleman—reassured. Even when the news cycle streamed dark and stormy, this anchor’s moral center radiated. Bill Bolen, I miss you. We need you now. More than ever.